There are many causes of nausea, which can develop either with another condition or by itself. If you are feeling queasy, a number of herbal teas might help. Herbal teas are technically called “tisanes” as they are not the same as traditional black, green or white teas made from the Camellia sinensis plant, but rather they are made from a variety of plant components, such as roots, leaves, and bark. Since herbal teas have the potential for producing side effects and causing interactions with supplements and medications you are taking, ask your doctor before use. Ginger root is widely used to relieve nausea. Ginger has numerous qualities that help the digestive system. For instance, it encourages your body to make saliva and digestive enzymes for digestion. A number of studies back up ginger’s anti-emetic, or nausea-fighting, properties. One such study in the August 1990 edition of “Anaesthesia” found that ginger eased the nausea of patients after surgery as well as a common medication taken for the same purposes. Ginger was significantly better than placebo. To make ginger tea, slice and chop two tbsp. of ginger root. Boil this with a cup of water and then simmer it for an hour. Strain the ginger root pieces from the water and enjoy the resulting tea. For an easier version, buy pre-packaged ginger tea bags. Ask your doctor before using ginger for nausea. Peppermint tea is a popular nausea-reliever that makes a strong tea for easing nausea when combined with ginger, according to Victoria Zak in her book “20,000 Secrets of Tea.” The menthol in peppermint seems to numb nerve endings in your stomach so you do not feel nausea. You can make peppermint tea by steeping two tbsp. 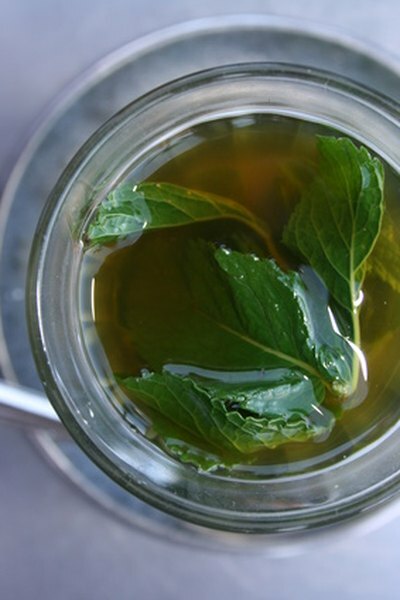 of chopped mint leaves in one cup of boiling water for seven to ten minutes. Other options include making tea with a small amount of peppermint essential oil or with pre-packaged peppermint tea bags. Peppermint can have side effects including heartburn. Although many alternative health practitioners swear by its effects, more research is needed to determine if peppermint effectively treats nausea. You can find two types of chamomile: Roman and German. While they are different plants, they have similar properties. They both help digestive problems and have antispasmodic qualities, but Roman chamomile is more often used for nausea. Make chamomile tea by steeping two to three tbsp. of the leaves in one cup of boiling water for ten to fifteen minutes, or buy pre-packaged tea bags. Ask your physician if you should take chamomile for your nausea. While perhaps not as well known as the previous herbs, wild yam is another type of herbal tea that might relieve nausea. This plant is different from yams we eat and is used for a wide variety of digestive concerns. To make wild yam tea, slice and chop one to two tsp. of wild yam root and steep in boiling water for three to five minutes, or buy pre-packaged wild yam tea bags. Wild yam can act like a hormone in your body, so check with a doctor before using it. Research does not back up claims that wild yam relieves nausea or other digestive problems. PubMed.gov: Ginger Root – A New Antiemetic. The Effect of Ginger Root on Postoperative Nausea and Vomiting After Major Gynaecological Surgery.